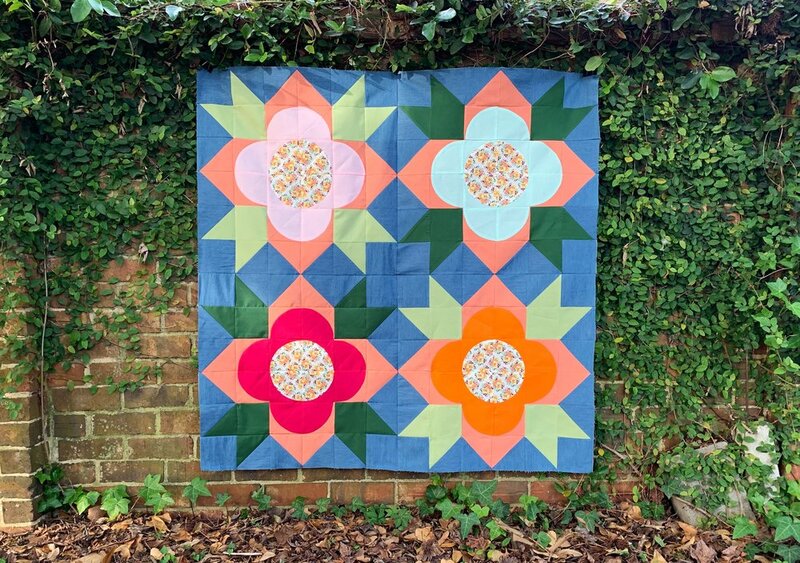 There is something new blooming this Spring - the Flower Shop quilt is now available! I am beyond excited to share with you my latest quilt - Flower Shop! This is a BIG block pattern - I’m talking 24” x 24” square for each block so it’s definitely a statement quilt. The Flower Shop quilt is a big block pattern composed of three different block styles. Fun as a mini quilt, throw or a larger bed sized quilt - these big blocks will really stand out. Video Tutorial link included in PDF pattern sharing tips on how to sew curves. Flower Shop Coloring Template link in all sizes included in PDF pattern for you to plan out your project. Finished Size: Quilts run large for bedding sizes - if you like a smaller fit size down for your project. I hired my friend Jess - from Threaded Quilting to do this amazing long arm work, I like the retro feel of the lines and how the circles mimic the center of the flowers. We will begin our Quilt Along in just a couple of weeks on April 22nd, this will give us some time to plan out our fabrics and practice sewing some curves! Sign up below if you would like to join in on the fun - and if you are new to sewing curves do not fear! I will be here to help you out with some videos and Instagram / FB live so we can work on our curves together. For the Quilt Along we will be working on the 9 block throw size quilt over the course of 6 weeks. Sign up with your email address to receive news and updates on the Flower Shop Quilt Along. Special thanks to Paintbrush Studio Fabrics for sponsoring the fabric I used on my cover quilt - I fell in love with the Painter’s Palette Solids and the backing which is a new line coming soon from A Beautiful Mess called Flower Market. I had an absolutely amazing team of testers for this quilt, some are still working on their projects so I will be sure to share the rest of the quilts as soon as I have more photos. Can’t wait to check out the progress over the next few weeks and see what fabrics everyone has chosen!